On October 20-21, the Democracy Study Centre (DSC) – a project founded by the German-Polish-Ukrainian Society (GPUS) and implemented in cooperation with the European-Ukrainian Youth Policy Centre with the generous support of the Federal Foreign Office of Germany, successfully organised Forum “Pulse of Ukraine.” The Forum brought together almost 200 young participants from Kyiv and other cities from all over Ukraine and more than 20 speakers from more than 11 countries. The programme of the Forum was very intense. A fascinating series of 6 discussions took place on Friday and Saturday. On Saturday, October 20, the first panel discussion on Cyberspace security, propaganda and fake news focused on the concept of hybrid warfare. The second session was about building the economy and building the Mittelstand. The panel’s participants talked about how to get a really stable and sustainable economic growth in a country that is still going through the enormous upheaval of overcoming its past of communist history. The third discussion focused on how Western Europe and Eastern Europe complement each other and can inspire each other to overcome the challenges to liberal democracy that we are seeing today. It discussed Ukraine’s crucial role in the region in the revival of Eastern Europe. The fourth and the last panel discussion on Saturday was about advancing democracy itself and the rise of populist nationalism is a challenge to liberal democracy and why democracy itself is a very complicated concept. 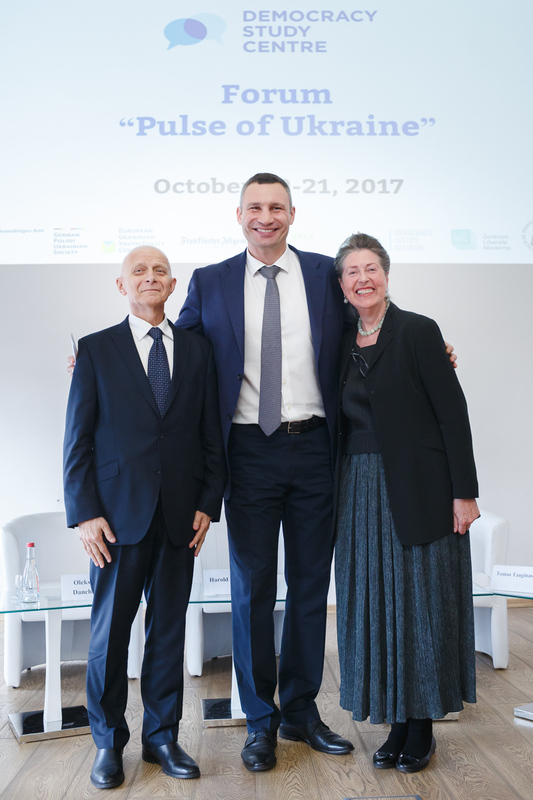 Left to right: Marek Belka, Former Prime Minister of Poland, Founding Rector of the Democracy Study Centre, Vitali Klitschko, Mayor of Kyiv and head of the Kyiv City State Administration, and Barbara-Maria Monheim, Founder and Chairwoman of the German-Polish-Ukrainian Society.